A lively Indian based in the student centre of Broomhill, the Balti King has won any number of awards, most of which seem to be hung on the walls to make interesting reading whilst you wait for your Chicken Tikka to arrive. Food and service is of a good consistent standard and the prices are reasonable too. There are a few unusual dishes on the menu, which add a touch of interest if you feel adventurous, but all the usual dishes are there too, including a good range of vegetarian options. A plus point is that the chefs are accommodating enough to cope with cooking meals to your preference if you ask. Oh, and another thing, become a regular and you’re likely to get one of their special Christmas Cards and perhaps receive discount vouchers every so often, which make it even more inviting! Some of you may have read my (rather shorter) op on this subject a while ago, but I thought it was about time I did Balti King justice! This is the first of my series of ops on great places in Sheffield, having just come back from visiting them all! The balti has been around for quite some time now, and really originated around the Midlands, based on some Indian starting points. Balti King opened in 1984 in Broomhill, Sheffield, hoping to move some of this balti deliciousness to the North, and it ’s certainly succeeded in that! Since then, it’s gained a whole portfolio of awards, from the Sheffield Times Indian Restaurant of the year award, to the European Food & Drinks award, as well as it’s own entry in the Good Curry Guide. It is situated in the main shopping area of Broomhill, just outside the city centre, opposite that most wonderful of music emporiums, Record Collector (coming soon!). It’s situated quite near a lot of the student accommodation (Tapton hall, Crescent Flats), and so is a great place to visit on your way back from the uni. I was introduced to the place by my girlfriend who studies at Sheffield University, and she’s certainly given me (yet another) reason to keep visiting Sheffield! The first thing that hits you when you enter Balti King is its size – it isn’t exactly the largest place in the world, but then it isn’t overly small for it’s needs. There hasn’t been a time when I’ve been there and had to wait for a table. There’s also a room above the restaurant which I think is used for larger parties and I think they can be booked too, which is nice. One of the waiters will take you to an appropriate table on entry, and they’re quite friendly with you, especially if they’ve seen you in there before! The main room is quite cool because of the fans fitted to the walls. At this point it is important to mention the music. Most of you will know that when you go to an Indian restaurant, you’re quite often treated to either silence of some ‘ethnic’ music. While it’s nice to have the atmosphere, it’s not exactly my choice for top music. Thankfully this is not so with Balti King – they have properly English music, calm and atmospheric – often a few love songs and ballads – that sort of thing. When you arrive at your table, you’re handed some well presented menus – the kind of A4 card type ones – hence four sides of menu. You’re also served with an appropriate number of poppadoms – customary pre-meal fodder for baltis – and four different sauces to have with them, some tasty tomato and onion sauce, mango chutney, a minty white sauce and another sauce that I’ve forgotten. These are served in a four armed holder which makes it easy to deal with. After you’ve sat there arguing over which starter to have (I always think it’s better to have something everyone likes, and then share like a buffet type arrangement – more variety that way), a waiter will come over and take your order. There’s the customary communication problems, as with all baltis – either they can’t understand you quite properly, or you can’t understand them quite properly – but as long as you’re clear and certain about what you want there’s no problems. The waiter takes your menus and comes back later with your starters. These are generally well presented on small plates. Last time I went, I had a nice Seekh Kebab – a spice piece of meat (god knows what’s actually in it!) – and my girlfriend had the customary Onion Bhaji, which is effectively onion fried in batter with some spices, and is very nice. Both came with a small side serving of fresh salad. I must say it’s nice to see fresh salad for a change, rather than the limp ‘going-brown-around-the-edges’ stuff you seem to get from a lot of restaurants these days. Once the starters are finish, the waiters come along promptly and clear away your plates, and it isn’t long before your main meal arrives. All the baltis are served in proper balti pans as they were intended, so you certainly get your moneys worth! It’s been a while since I had rice (I can’t manage that much food!) so I forget how that is served, but the Naans are served on plates, and they are HUGE. Look at your keyboard and you’ll get a rounh idea of the size – seriously, it is THAT big. Me like! » Starters. The starters are probably the most varied meals on the menu, the majority of the standard size starters cost around £1.50, while the larger ones (Mixed Kebabs, Chicken Tikka) can go up to around £3. I prefer to take the ‘two £1.50 ones’ approach, because I get more variety then. I mean that between two people, not just me! » Main Meal. 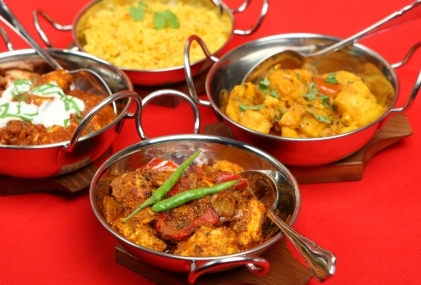 The main meals vary in price greatly, but you can get a good balti for around a fiver, maybe a little more. There’s everything you could think of – balti, madras, curry, korma, vindaloo, dopiaza, bhuna, massala, dansak, biryani – although I generally find myself going for the Chicken Tikka Massala, or Chicken Balti for about £5.50. » Desserts. If you can manage a dessert after all that food, then there’s plenty of nice stuff to choose from. Force one down if you can! The sorbets are nice! You’ll also be pleased to know that Balti King has a licensed bar too, with plenty of beer and wine, although a glass of coke for a quid is a lot more cooling I find. Plus you can get all the water you can drink for free. Which is a nice addition. Another nice feature of Balti King is how they cater for your needs – if you can’t eat all you’re given, then you can just ask one of the nice waiters to box it up for you, and you can take it home for later. It isn’t just shoved in a bag either – the baltis are put into nice boxes and sealed, which the naans are wrapped up for you. Top service. And a nice midnight meal of balti too. If you’re a really lazy, um, so-and-so, you can even order in from Balti King, and if you live within their 3-mile radius, you get free delivery too. So you eat your balti from the comfort of your own home – what more could you want! If all that hasn’t got you running for the door/telephone, then get this: Balti King even sells it’s own MERCHANDISE, it’s that popular. Bloody hell, you’re saying. Well, the meals ARE great, and the service is great. The prices are pretty good too – you can get a top class perfect meal for £20, and it can be a lot less if you use a special offer, or just eat a bit more sensibly! Balti King is great, and I love it – visit soon!